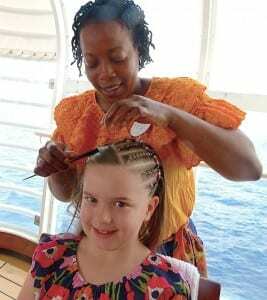 Grace Miller gets her hair braided by Janice Clark on a Disney cruise. Several young girls were waiting their turn to be made into braided princesses. Watching her daughter get her hair braided near the ship’s pool, Valerie Miller of Dallas says the option on the ship is a nice service. This way, Valerie say, youngsters or adults can get the popular braids while they are still enjoying the ship and they know that the hair design is being done by Disney professionals at a fair charge. Fees depend on how many braids are being done and what kinds of beads are being used. Of course, 7-year-old Grace Miller had no idea what I was talking about when I mentioned Bo Derek and her braids in the 1979 movie Ten. That was long before Grace’s time. Grace considers that her braids will be an eye-catching souvenir when she gets home, plus they will help keep her hair out of her eyes when she is swimming on the cruise ship’s windy top deck.